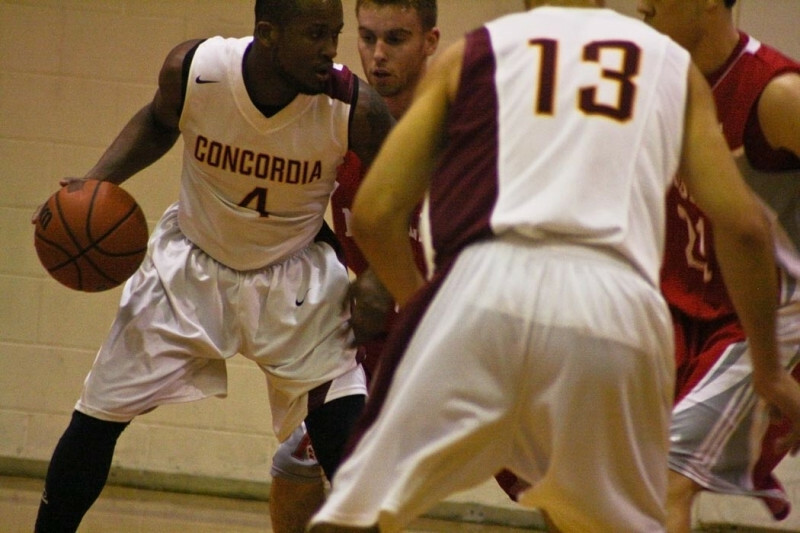 Concordia’s men’s basketball team didn’t appear ready for what the McGill Redmen had planned Thursday night, as their opponents entered the Concordia Gym firing on all cylinders. “I’d say 80 per cent of us weren’t mentally ready for this game,” said Stingers guard Kyle Desmarais, who led the team in scoring with 21 points. One of the reasons for that lack of preparation was because McGill’s star point guard Adrian Hynes-Guery was out with an injury. “Some of the guys thought they could sit back and take their foot off the pedal with [McGill’s] best player out of the game,” explained Desmarais. The Redmen took full advantage early on, as they led by as much of 10 points in the first quarter courtesy of strong efforts by Simon Bibeau and Vincent Dufort, who led the team in scoring with 19 and 13 points respectively. But before McGill could run away with the game, Desmarais got a steal toward the end of the first that turned the tide in the Stingers’ favor. The momentum shift was in full swing by halftime, with the Redmen making numerous mistakes as the Stingers took over the lead and ended the half up 29-24. “I just thought when they tightened up their defense, we panicked. We didn’t run our offense as well as we did earlier,” said Redmen head coach Dave DeAveiro. In the third quarter, the Stingers appeared to have the game under control, enjoying as much as a 10-point lead with help from Evens Laroche, who had a 14-point night, before ending the frame leading 48-40. Then, in the fourth quarter, they got a little too comfortable again. “McGill always comes out hard, so you can never take them lightly,” said Desmarais. Up by 11 points less than two minutes into the quarter, the Stingers saw the Redmen soon regain momentum when Stingers forward Kafil Eyitayo turned the ball over just a minute later. Before long, McGill was off on a four-minute hot streak, by the end of which both teams were deadlocked at 53 with just under five minutes left to play. The rest of the game was a seesaw battle. Laroche managed to get the winning basket off a jumper with 30 seconds remaining, but McGill kept fighting to the last second, nearly scoring before time expired. While the Stingers weren’t happy with their performance, they had reason to celebrate. For one thing, the victory put them in first place in the Réseau du sport étudiant du Québec conference. Secondly, it marked the return of guard Morgan Tajfel, who had sat out the past seven weeks with a knee injury.